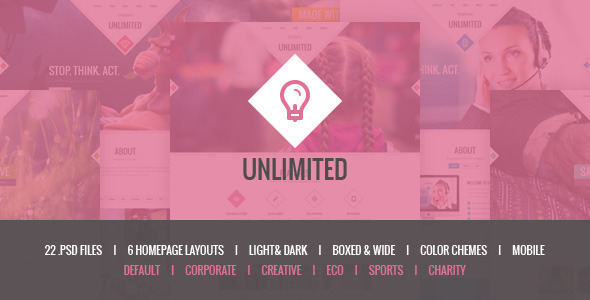 Unlimited is modern, clean and professionally crafted PSD template. It has 6 homepage layouts: Default, Corporate, Creative, Eco, Sports, Charity and coming more! This template suits for any type of portfolio, personal website, business, corporate, design studio etc. This PSD Template has many accent color chemes, dark & light versions, boxed & wide versions and mobile version. The psd is designed on grid and can be easily converted into responsive HTML and WP. This entry was posted in psd-templates and tagged bootstrap, business, charity, clean, corporate, creative, ecology, gym, modern, multipurpose, parallax, personal, portfolio, sport by Acty. Bookmark the permalink.